A longstanding Wisconsin institution established in the late 19th century to improve and establish standards for the state's system of free public libraries, the Wisconsin Free Library Commission, is the subject of this Wisconsin Historical Images featured gallery. The gallery includes nearly 200 exterior and interior images of public state libraries that document their architectural details and illustrate the commission's recommendations and standards — not only architectural standards, but emerging library practices and subfields, such as children's services. For example, library pioneer Lutie Stearns, the commission's first paid staff member, advocated for open-stack access for youth. She argued that, with a properly trained librarian, free access to the shelves is not only possible for children, but recommended. Photographs in the collection depict examples of libraries that enjoyed success with children having access to open-stacks. An act of the Wisconsin Legislature (Chapter 314, laws of 1895) established the Wisconsin Free Library Commission in 1895 "… to give advice and counsel to all free libraries in the state, and to all communities which may propose to establish them, as to the best means of establishing and administering such libraries, the selection of books, cataloging, and other details of library management. The commission may also send its members to aid in organizing new libraries or in improving those already established." Due to the initial success of the Wisconsin Free Library Commission, the next Legislature expanded its duties and provided more resources. In 1901 and 1903 lawmakers again broadened the scope of the commission and provided even greater financial means. By 1904 the mission of the Free Library Commission had expanded beyond organizing new libraries and giving aid and guidance to those already in existence. The Commission maintained a system of traveling libraries and served as a clearinghouse for periodicals in order to build up reference collections of bound periodicals. 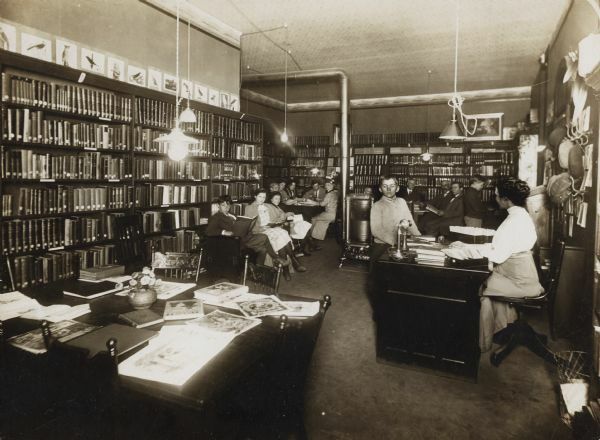 It also operated a document department for the care and exchange of state documents, established a legislative reference library in cooperation with the Wisconsin Historical Society and established a summer school for library training to improve service in small public libraries. It frequently issued book lists for the guidance of librarians and book committees and gave advice regarding library building plans, using a collection of plans created for the benefit of Wisconsin libraries. In 1965 the Wisconsin Department of Public Instruction incorporated the commission and its responsibilities, renaming it the department's Division for Library Services. It remains a division of the Department of Public Instruction, now known as the Division for Libraries, Technology and Community Learning.